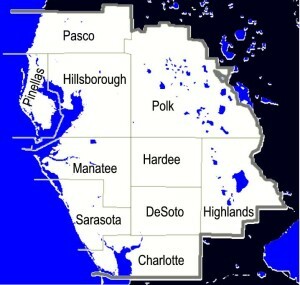 The ARRL West Central Florida (WCF) Section includes ten counties. There are over 2,000 ARRL members who live in the ARRL WCF Section. The section includes a wide range of communities from metropolitan cities to rural towns and villages. Florida is best known as a tourist destination, and the communities in the West Central Florida Section boast some of the best beaches, world renowned museums, as well as favorite tourist destinations such as Busch Gardens in Tampa, Legoland in Winter Haven, and the Ringling Museum in Sarasota. The ARRL West Central Florida Section is home to several large corporations. There are several prominent industries including agriculture (including citrus, tomatoes, and strawberries), phosphate mining, and high-tech manufacturing. The ARRL WCF Section is also home to the University of South Florida in Tampa, which is the second largest university in Florida and one of the largest in United States with over 34,000 students. If you are visiting or relocating to a community in the ARRL West Central Florida Section please consider visiting one our many amateur radio clubs, use the area repeaters or attend a hamfest. If you are looking for more information about the clubs in please visit our WCF Clubs page. You will find a listing of hamfests on the Calendar page. If you are looking for more information, or have a question please feel free to email any of the members of the WCF Section Cabinet!